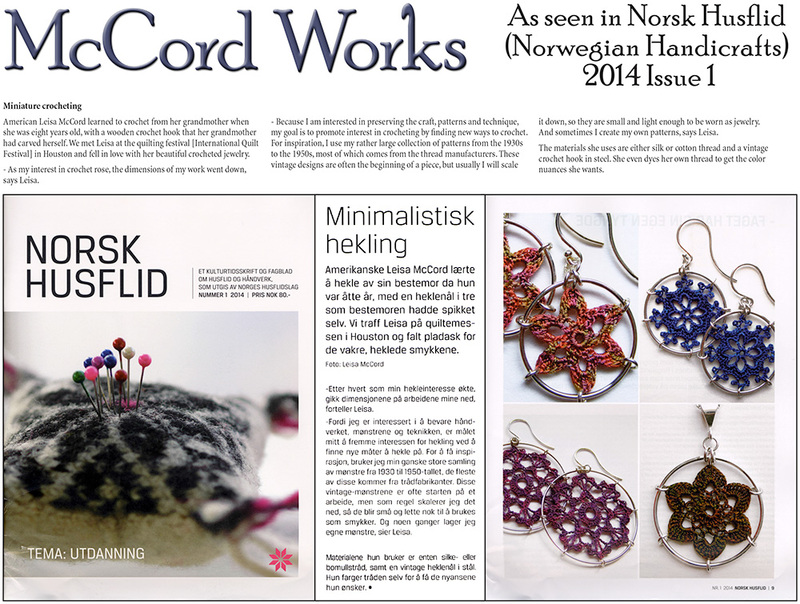 I have a little article in the most recent issue of Norsk Husflid (Norwegian Handicrafts), the journal published by the Norwegian Folk Art and Craft Association, which promotes traditional craft in Norway. The organization has been in existence for nearly a century, and the journal is coming up on its 50th anniversary. It is the most widely distributed magazine in its segment in Norway, with a circulation of over 26,000 per issue. I met the editor of Norsk Husflid at the International Quilt Festival in Houston last November. She and her compatriots were having a marvelous time at this spectacular event, and she promised she would put me in the journal. Imagine my surprise when she did actually email me to ask for photos! I am deeply honored to be included in this lovely and prestigious journal. They only post the main articles online, but the editor sent me a hard copy, and I have a scanner. So here is the journal cover, my article and my photo page, complete with slightly crumpled corner. Thanks to Google Translate and my British/Texan/future-Spanish friend Paul, who I recently learned is fluent in Norwegian! American Leisa McCord learned to crochet from her grandmother when she was eight years old, with a wooden crochet hook that her grandmother had carved herself. We met Leisa at the quilting festival [International Quilt Festival] in Houston and fell in love with her beautiful crocheted jewelry. – As my interest in crochet rose, the dimensions of my work went down, says Leisa. – Because I am interested in preserving the craft, patterns and technique, my goal is to promote interest in crocheting by finding new ways to crochet. For inspiration, I use my rather large collection of patterns from the 1930s to the 1950s, most of which comes from the thread manufacturers. These vintage designs are often the beginning of a piece, but usually I will scale it down, so they are small and light enough to be worn as jewelry. And sometimes I create my own patterns, says Leisa. The materials she uses are either silk or cotton thread and a vintage crochet hook in steel. She even dyes her own thread to get the color nuances she wants.